Once upon a time, only those who truly believed in fairies could see them dancing across the lawn, balancing upon a twisted limb, or frolicking among the flowers. Fairies live among the flowers, often adapting blossoms for their clothing and ornaments. 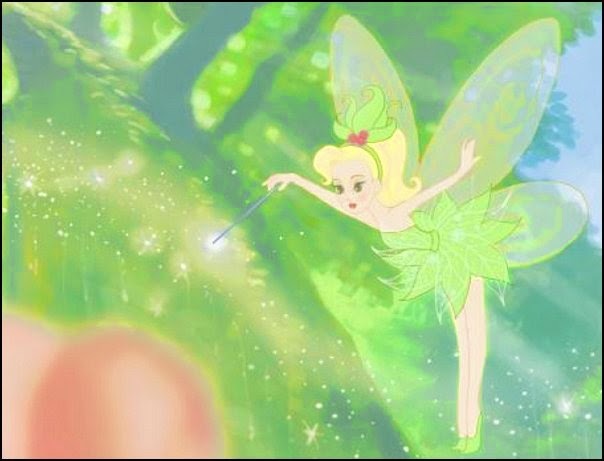 Fairies also love unusual seashells, sparkly ribbons, shiny gemstones, mirrors and magical flowers. After centuries of being hidden from human sight, the Flower Fairies allowed Cicely Mary Barker a glimpse into their enchanted fairy world in Fairyopolis. Now you can continue the adventure and create your very own magical garden that will attract Thumbelina herself! Our enchanting stool is fashioned to resemble a tree stump, and it's perfectly sized for full-grown people to sit on or use as a side table. 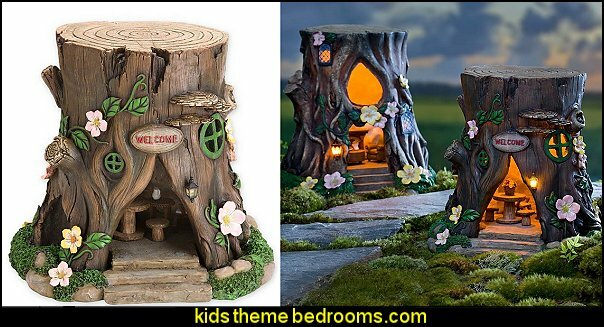 Weather-resistant resin stump is crafted in amazing detail with lifelike bark and rings, but the magic is in the details: A tiny door greets little visitors with a sign declaring "Fairies Welcome", and little windows adorn the front. Perfectly charming in a miniature garden or flower bed, or bring it indoors wherever you want a whimsical touch. Welcome nocturnal visitors with this pretty Teardrop Window House Stump, solar-powered to light the way to your home. Our resin garden decoration features a beautiful bay window with a large light powered by a solar panel at the back, turning it on at dusk. Flowers and realistic moss add natural charm. Stump is fully furnished inside with permanently attached accents - a cozy hearthside scene with fireplace, chairs and table. 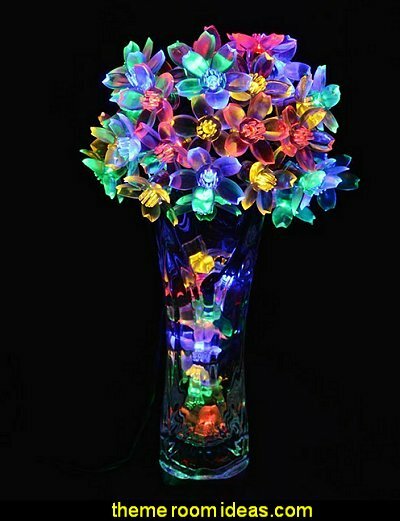 Place along a walkway or in your garden for a soft, warm glow. 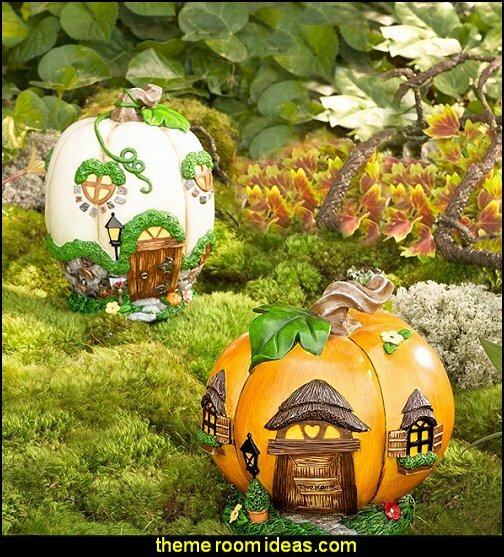 Fall into autumn style for your garden with these cute fairy Pumpkin Houses. 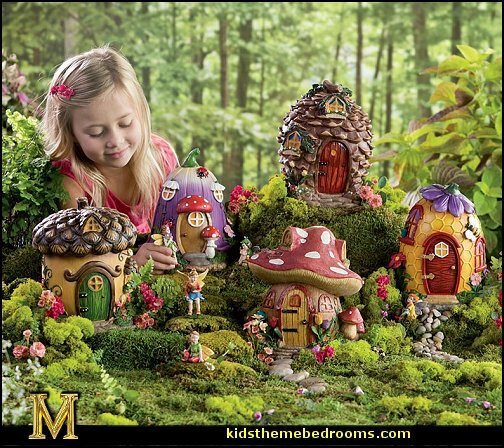 Miniature resin homes add a little seasonal magic to any fairy garden. 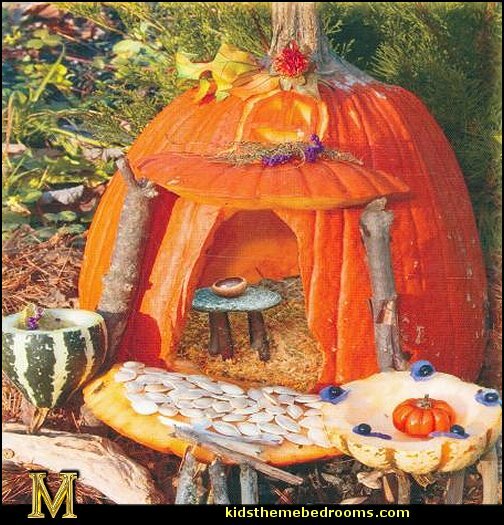 Beautifully detailed Pumpkin Houses feature stone foundations, windows and doors, chimneys and more. 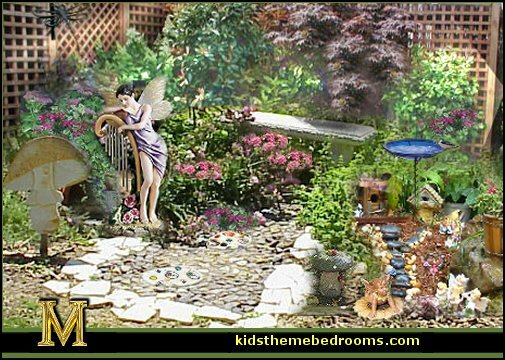 Design an enchanting miniature garden filled with fluttering fairies, mini mushrooms, friendly gnomes. 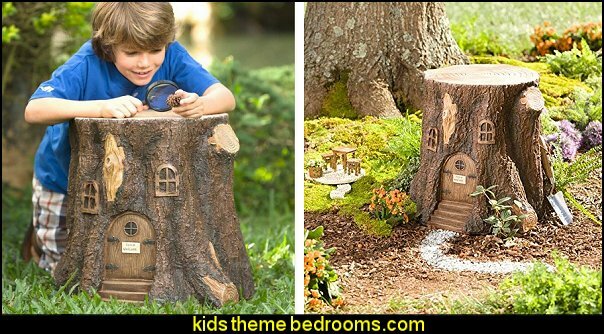 Accent tree trunks with garden gnome doors, with splashings of colorful flowers, tall elegant plants that would immanently suit the needs of the wee folk and lots of glitter and sparkle scattered around. Flower fairies can be found resting against the stem of flowers, balancing on leaves, swinging from the branches of trees. Where hidden in the glisten of a buttercup one could catch a glimpse of fairy spilling forth glittering gems and sparkling stars, or tucked tight in the softness of a budding rose a sleeping fairy dwelled. Walking through the forest, we stumbled across a wondrous mossy fairy village. 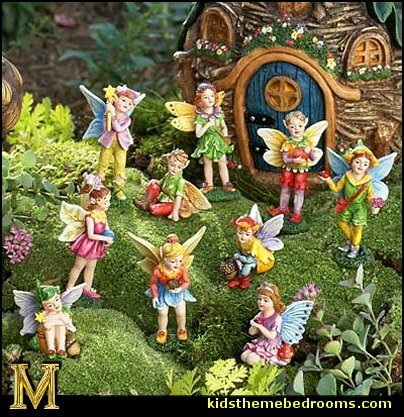 Now that you have the houses, the fairies are ready to move in!Add the finishing touches to your Fairy Village with miniature fairy furnishings. Playful sprites hidden in the wonderful world of lavish gardens and fragrant blooms. There, nestled among the tender petals, live the garden fairies, childlike in their innocence yet wise to the ways of nature's blossoming mysteries. Hidden in the magical secret garden, you will find the boylike fairy with gossamer wings resting gently in the cupped petals of a soft peach rose, as pearls of dew glimmer in the morning rays of sun. Another tiny waif dusts the bloom of a brilliant yellow chrysanthemum hiding. 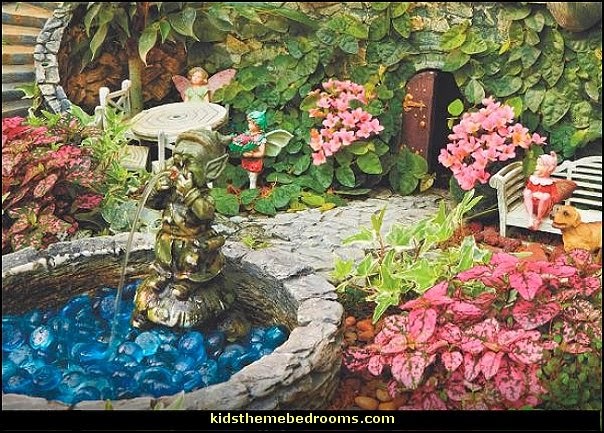 Create gorgeous miniature gardens worthy of a fairy! Garden Gnome Door A must have garden accent for your gnome collection. The Gnome Door includes a "There's no place like Gnome" sign and a removable window for two fun looks! A fun addition to your patio, deck or garden decor. The garden door and window attach to the base of a tree. Hang our tiny Elf Door on a tree to encourage local elves and fairies to come and go through your yard. Beautifully detailed resin accessories are weatherproof. The door with its scrolled "hinges," handle and little window, adds a fun, fanciful touch to any landscape. 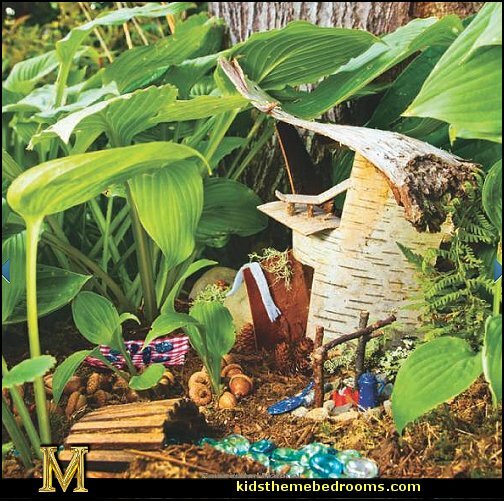 With their tiny shutters and detailed window boxes full of flowers, our set of two windows add a homey touch to your fairy home. 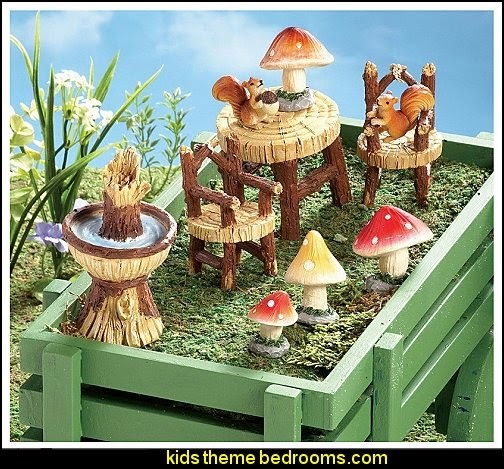 This delightful Woodland Fairy Garden Resin Furniture Set is sure to attract fairies, pixies and the like! Arrange them anyway you like! They make a whimsical addition to planter, flower bed, zen garden and more. 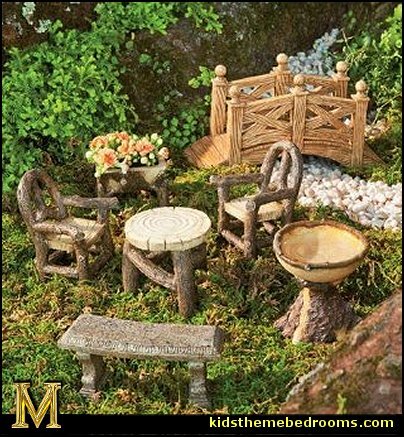 Our Woodland Fairy Garden Resin Furniture Set includes seven pieces: two arm chairs, a round coffee table, crescent bench, birdbath, planter (flowers not included) and a foot bridge. 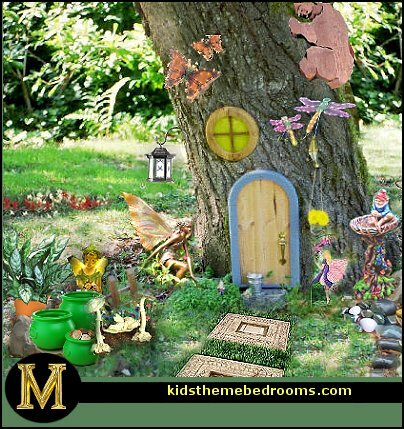 Creativity for Kids Wee Enchanted Fairy Garden Kit. 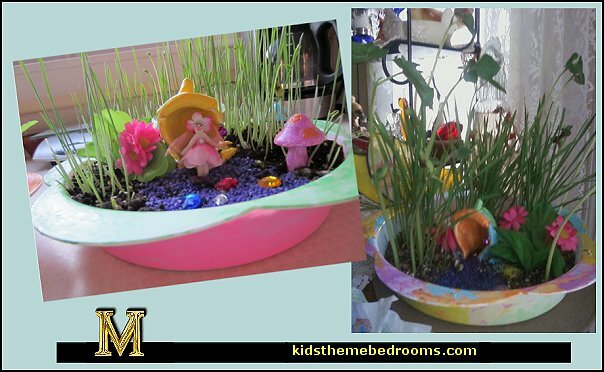 Create and grow your own magical miniature fairy land! Plant the seeds and beans; water and fairy Hannah will help from there! This package contains an 11in fairy garden dish; flower fairy Hannah; resin fairy house; two resin toadstools; sparkling gems; glittery pixie dust; two tulle butterflies fabric flower bouquet; glass opti-stones; purple gravel; seeds (wheatgrass and bean mixture); potting soil; fine tipped paint brush; six acrylic paints and illustrated instructions with lots of ideas. Recommended for children ages 7 and up. WARNING: Choking Hazard-small parts. Not for children under 3 years. This adorable 10-piece set of garden furniture includes 2 chairs, a table, a fountain, 2 cute squirrels and 4 colorful mushrooms. The intricate designs are accented with hand-painted details. 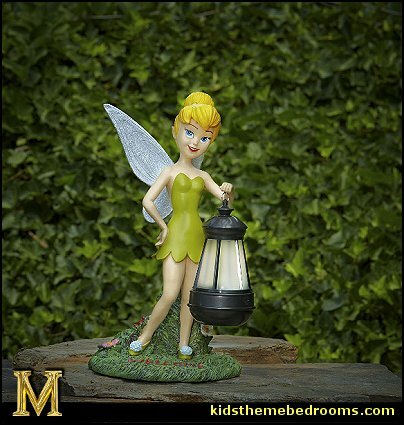 This 12in Tinkerbell with Solar Lantern is one of the best ways to adorn your home garden or patio with a touch of Disney magic. 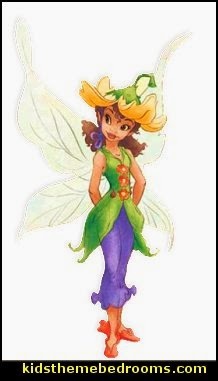 Children and adults alike have been in love with Tinkerbell since she made her most notable appearance in Disney’s animated version of Peter Pan. Regardless of the theme of your home or garden, Tinkerbell lighting the way with her solar lantern is just the special touch to make it all magical. Fairy Gardening is a creative breeze. 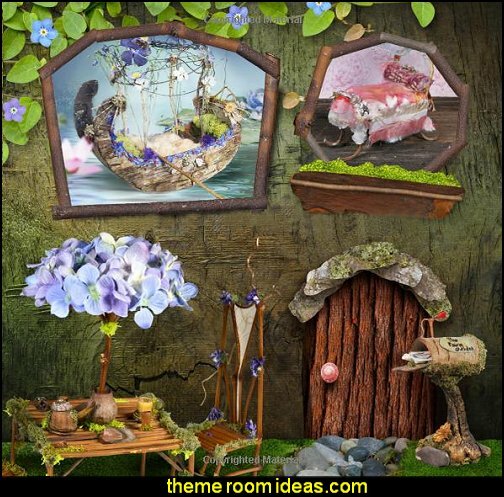 Lots of ideas for fairy gardens to create and loaded with ideas for decorating the fairy garden. 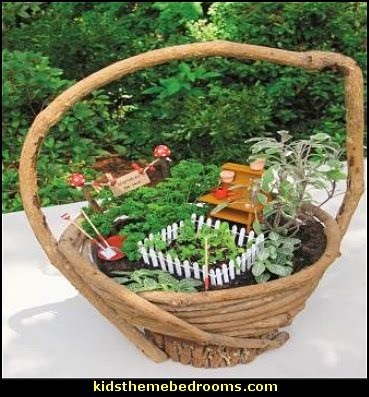 Makes the art of miniature gardening simple and fun! 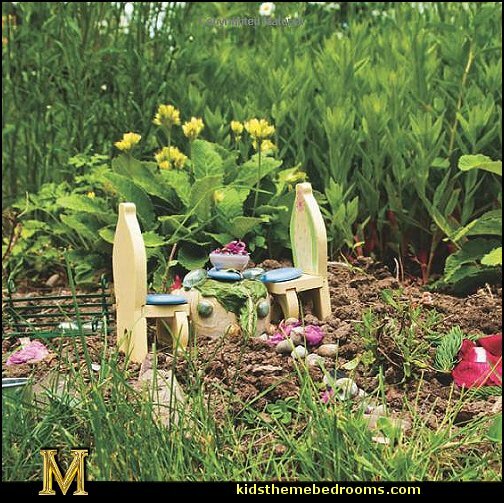 Design and build your own fairy houses and hide them in the garden to create a secret little world of magic right outside your door! Fairy Houses, an enchanting children's picture book that answers the question, "What would happen if you built a house for fairies to live in? Would the fairies come to visit?" Fairy Houses contains artwork of forests and butterflies and gives the pages the feel of the outdoors, but perhaps the highlight of the story is the set of general instructions that children can follow to build fairy houses of their own: "You should only use natural materials to build the house. Dry grasses, pebbles, sticks, shells, feathers, seaweed, pinecones and nuts are just some of the materials which call to the fairies." Take a fresh new look at miniature gardening with fairy gardens. 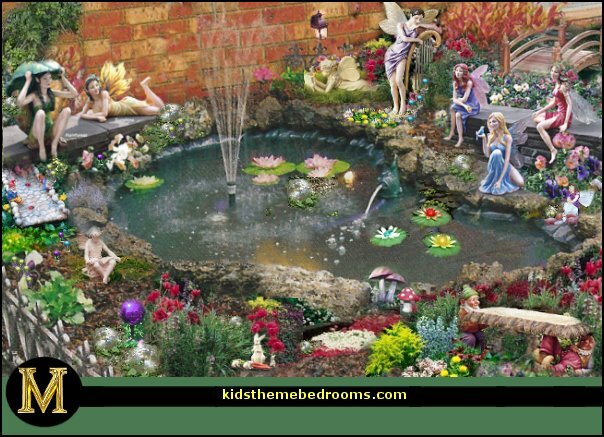 Fairy Gardening 101 gives step-by-step instructions for creating twenty-one different fairy gardens that take only fifteen minutes to create. Each themed fairy garden has a supply list and suggestions for creating your own personality-themed fairy garden. Fairy gardens don't have to be expensive or difficult. With clear instructions on which plants to use, soil mixes, and places to pick up fairy-like accents, this is a beginner's guide to creating little fairy worlds of your own at an affordable price. Fairy Houses . . . Everywhere! 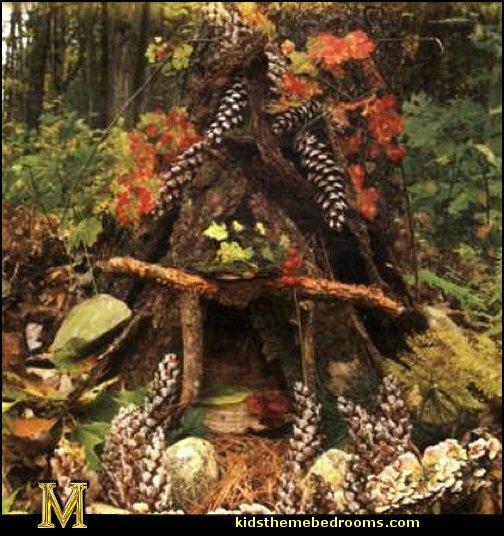 From rustic dwellings to fairy mansions, this whimsical collection of photographs depicts fairy habitats in various places—from woods and parks to backyard gardens and the beach—and encourages children to explore nature using creativity and imagination. 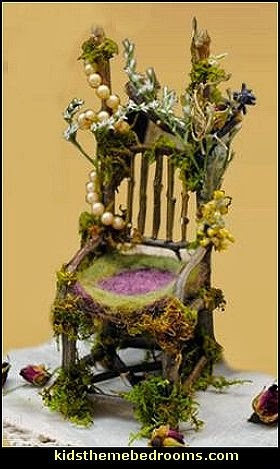 Fairy garden designer and artist Linda Haas shares her step-by-step process of building fairy furniture from twigs and other natural materials. 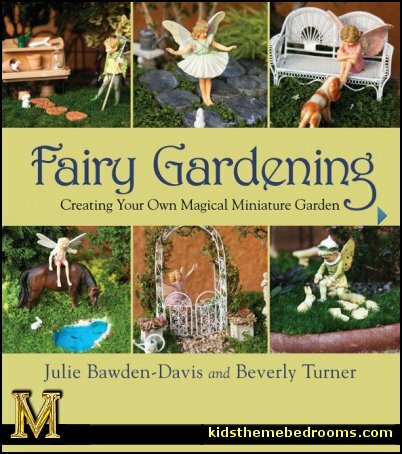 You will be inspired to learn how branches, dried flowers and broken jewelry can become part of a miniature fairy garden accessory. 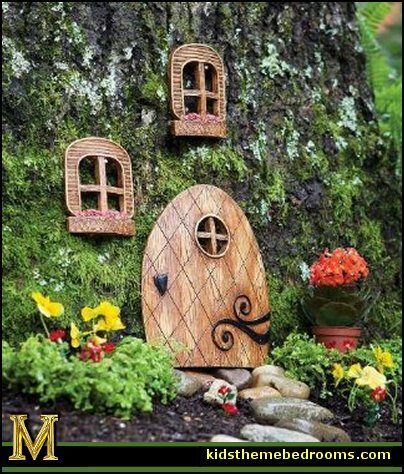 This book also contains other fairy garden craft ideas and is filled with pictures to inspire the fairy garden artist in you. Does your child love the special make-believe magic of Fairyland? If she does - Fairy Fun will delight with all kinds of wonderful, creative, and easy fairy crafts and activities. 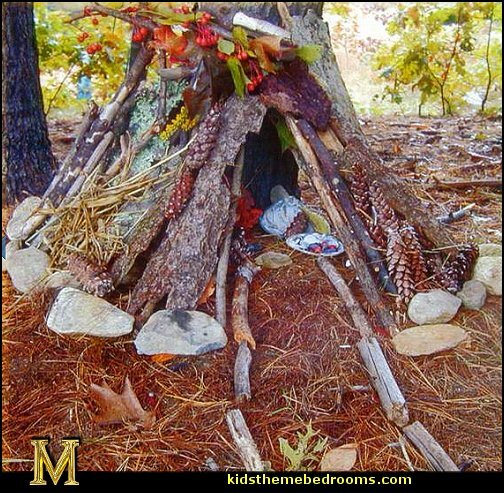 Using simple items found around the house and garden, your child can make fairy dust, a magic wand, fairy wings, and a fairy house. She'll make a pretty flower doll, grow a magic garden, and play with a fantasy sun catcher. She'll learn the best way to make wishes come true, how to do a fairy dance, and how to discover fairies outside. She'll find easy magic tricks, fairy riddles, tongue twisters, lots of fun ideas for playing with friends, and games for fairy parties and sleep-overs. With its wondrous color illustrations and imaginative projects, Fairy Fun will win the heart of every child who knows just how real fairies are. Fairy Fun provides all the information and material you need to provide an enchanted fairy wonderland for your child. Every little girl loves to dress up and wave that magic wand. 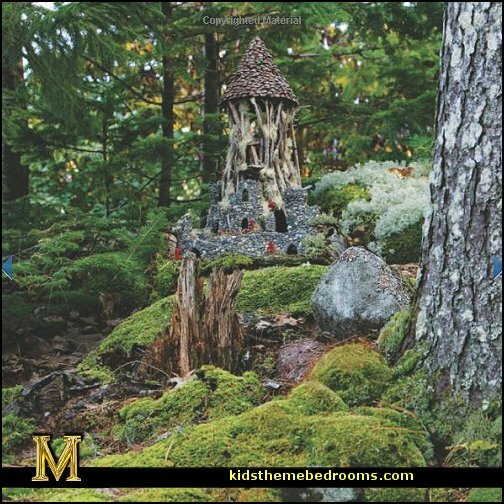 From magic spells to fairy gardens, you and the little ones in your life can create and experience the magical realm of the wee folk. Many mini-gardens require little to no care, other than adding or changing accessories, once they’ve been planted. If you want to actually “tend” a little garden, this is the project for you. The Mini-Kitchen Garden uses herbs such as parsley and sage for the “trees” and polka dot plants (non-edible) for shrubs. Inside the tiny picket fence, there’s a pot-within-a-pot where you can plant seeds for microgreens. After centuries of being hidden from human sight, the Flower Fairies allowed Cicely Mary Barker a glimpse into their enchanted fairy world in Fairyopolis. Now you can continue the adventure with this spectacular new novelty book where every page unlocks the secrets behind the magical places the fairies call home. Five eye-popping spreads include intricate three-dimensional pop-up images of flowers and trees that magically open up to reveal the secret homes of the fairies. Lift-the- flaps, booklets, maps and other ephemera provide interactive fun on every page leading up to a stunning surprise on the final spread. Nature crafter Laura Martin has created a fantasy for fairy-lovers. The woodland cottage is filled with bent twig furniture. The Japanese house displays bamboo slippers outside the door, the beach house has a minute bath tiled with seashells. Each spread is filled with photos and drawings of these tiny objects, all identified with their botanical names. This is a very charming book for fairy fans as well as gardeners and fairies looking for interior design ideas. To leaf through these pages is to enter another world and dwell in it - the world of fantasy that has fascinated people through the ages. Recipes for scented, exotic potpourri blends. Fairy and herbal lore, poetry, seasonal stories, and gift ideas.Stir your imagination and summon enchanted creatures by bringing the fragrances of the garden into your home. Creating Fairy Garden Fragrances will help you to embrace and celebrate the changing seasons with recipes for dried flowers, herbs, and fruits. "You can hear the Fairies giggle while Faerie Queen Linda tells all her secret recipes to bring the enchanted fragrant beauty and fairy-dusted joy of a garden into your home ... it's magical." Divided into two main sections, "Including Children in the Gardening Activity" and "Making Gardening Fun for Children," It is packed full of fun ideas for a theme garden that children will enjoy, like planting a pizza shaped garden with all the ingredients for your kid's favorite pizza. You'll also learn how to surprise the kids with pumpkins that grow with their names on them. The book covers everything you need to know, for everyone from beginners to experts. Everything you need to know; soil, sun, what to plant, how to plant and where to plant it. For anyone who wants to learn more about "The Secret Garden" and its author - where the original garden really was, how an English robin differs from an American robin, how to make a nesting station for birds in your garden, what "oatcakes" and "doughcakes" are and how to make them (along with other recipes from the book), how to plant a miniature secret garden, create moss-covered flower urns, make a wind chime from keys like the one that unlocked the Secret Garden, and lots more! Wonderful gift. 52 projects offer easy-to-make additions for every outdoor area. Refresh windows with eye-catching planter boxes and shelves. Patios showcase lanterns and finials. Photographs are absolutely charming. Well written .... a great gift for the gardener in your life. simple bench or a charming birdbath, a graceful trellis or a weathered fountain - the right ornament in the right place can transform any garden into a lush, private Eden. Whether it's a classic suburban backyard, a small country garden, or a high-rise terrace with a city view, Garden Ornaments shows you how to select and position the perfect furniture and ornaments for any garden. Chapters on different garden styles - Classical, Waterside, Urban, Romantic, Rustic, Gallery, or Whimsical - and spotlights key pieces that help create these wonderful spaces. Opening up a new world of design options, Martha Baker guides you in choosing the right furniture and ornaments for your own garden - from such simple objects as urns, folding bistro chairs, or candle lanterns to more exuberant gestures like a steel topiary, a wrought-iron chandelier, or a trellis strung with lights. With hundreds of gorgeous photos and a wealth of useful information and how-to advice, Garden Ornaments is a boundless source of inspiration, sure to delight and instruct any gardener. Charming, beautifully photographed book, filled with recipes for decorative paths and walkways. Each plan is explained first in terms of the image, fantasy, and feel that's being created, and is then followed by a list of "ingredients" - the plants, tools, materials list, and step-by-step instructions. Paths and Walkways is suitable for beginners, but is sure to provide ideas for experienced garden planners as well. Each project can be adapted for very large or small areas, and has information on maintenance of the materials and care of the plants. The different paths and walkways are rated individually by expense, difficulty of implementation, and the type of location required in relation to sun and shade. Apartment dwellers can indulge their passion for growing edible things. If there is an available balcony, porch, front or back steps, according to the authors, growing produce in containers can be easy and rewarding. With some limitations, it is even possible to grow foods in a window box or on an indoor windowsill. This compendium of practical advice includes detailed information on the types of containers to use, equipment needed, the right soil, when to plant which seeds and how best to deal with problems such as too much or too little sunlight. Written for the beginner as well as for those with a background in gardening. Cross over the arched garden bridge to hear the mermaid calls, reflecting the wonders of the peaceful seas in the pond below. The mesmerizing music of wind chimes take your eyes upwards to see the frolicking fairies at play ... dancing around the sun catchers ablaze with color. Transport yourself into the realm of fantasy but still maintain the realism of the world around you.